It was Friday night, and I was in search of a decent cheeseburger to fill the void created by another week of working for the man. Bar Food was nearby, and it was due for a visit. Bar Food's cheeseburger had received mixed reviews, but I needed to find out about this cheeseburger for myself. 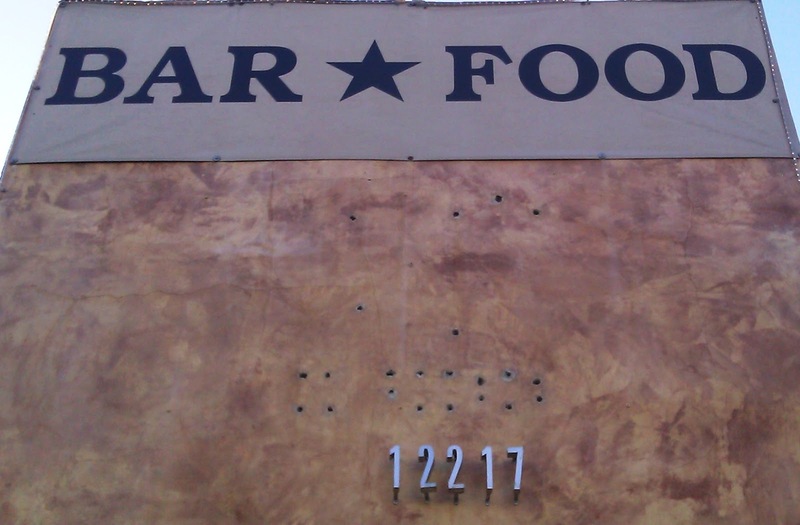 Parking was a breeze...metered on the street or free in the small lot in the alley behind the restaurant/gastropub. I was fortunate enough to have the chance to meet with Jason (Owner/Manager), and he was most helpful in giving me plenty of details about the restaurant and the menu. I ordered the Bar Burger and settled in for a 10-minute wait as the meal was prepared. More good luck--since I arrived during Happy Hour, the burger was $6.50 rather than the usual $9. 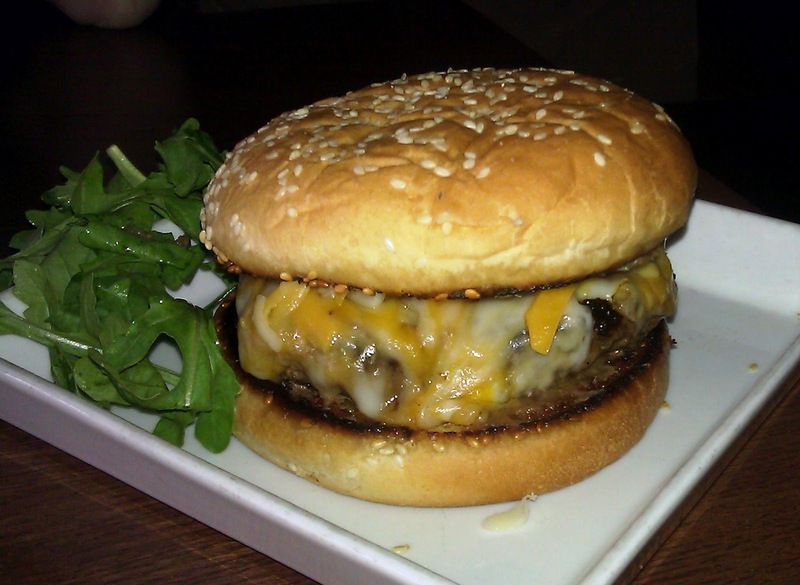 The Beef: The burger meat at Bar Food was sourced from National Meats. This was 100% Angus Chuck. The beef was fresh/never frozen. 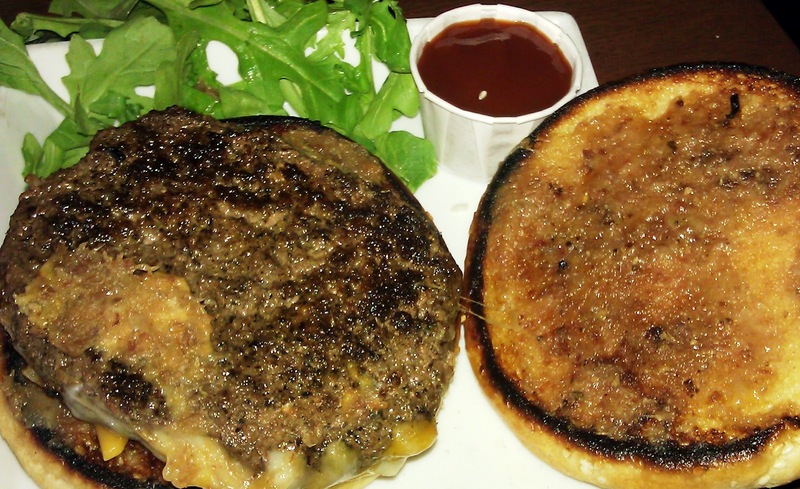 Each cheeseburger was built using a 1/3 pound patty. The beef had a fat content of 20%, and this worked. There was no residual oiliness from the juicy bite. The burger was pleasantly beefy. It carried a mild funk from wet-aging. This funk was apparent to the nose but not the tongue. The beef also delivered some mild mineral flavors. While this was mere Chuck, I noticed that the mouth feel resembled Brisket. There was a pleasing long-grainedness, and some of the beef fibers persisted throughout the bite. This was a pleasant surprise, and it was characteristic of high-quality cuts of beef. Overall, I was surprised by the quality of the beef in my cheeseburger. The Seasoning: Bar Food hit the exterior of their burgers with a generous amount of salt and pepper. Salt and pepper are generally all that a burger needs to make the beefiness pop. This treatment worked exceedingly well in this case. The Sear: The sear on my Bar Burger came courtesy of a stainless steel pan and some olive oil. The sear was crisp, deep, and dark. This, coupled with the hearty salt and pepper, created a surface akin to bacon, and bacon is good. The Preparation: The irregular, 1/3 pound burger patties at Bar Food were formed during the prep cycle. I requested Medium, and a competent Medium is what the kitchen delivered. The tender, loose bite suggested a gentle hand formed the burgers. This also suggested that the burgers were formed on the same day that they were cooked and served. The Cheese: Bar Food used a shredded Cheddar blend, and this really worked. The cheese melted readily and evenly. The blend resulted in a less oily and chewy bite than pure Cheddar. The cheese provided tartness, creaminess, umami, and salt to the dish. The Bun: Bar Food served the cheeseburger on nicely toasted, seeded, standard, burger bun from Old Mill Bakery. The flavor was buttery, mildly sweet, and a little yeasty. The texture was moist and tender. The bun was crisp all around the edge, and this provided a really satisfying crunch. This also provided just enough bitterness to round out the flavor profile of the burger. The Fries: The fries at Bar Food were of the frozen, bagged, and delivered variety. I did not sample the fries. The Toppings: The arugula was nutty and fresh....not at all bitter. The bacon jam was a nice surprise. Bar Food crumbled crisp bacon and then cooked it down with Balsamic vinegar and caramelized onions to create a sweet, tart, salty, smokey spread for its burgers. The bacon jam was a winner. The Value: At $6.50, the value was great. At the non-Happy Hour price of $9, the value would have been good. This was a really fine cheeseburger. Two burgers and a couple of beverages came out to about $23 at Bar Food. The Bar Burger at Bar Food was a pleasant surprise. I came in with moderate expectations, and I left looking forward to returning to have the burger again. Burger Review : Bar Food served up a well-priced, beautifully balanced, and high-quality cheeseburger. The burger looks fantastic. how full was the restaruant, its not overly crowded is it? The place was about 1/3 full at 6:30 PM on a Friday. Not too loud, and not too busy.